I leaped out of bed this morning and went for a run. Okay, I may have exaggerated the whole leaping out of bed thing. But I did run four miles. Okay, I may have exaggerated the whole running thing if you are imaging a sleek gazelle effortlessly sprinting. I'm more of a wogging shuffler plodding along only somewhat faster than grass grows. But it works for me (I follow a 3:1 run:walk interval pattern). Some runs are faster than others, some aren't, and that's okay. Moving is much better than not moving. Sometimes just showing up is more than half the battle. I'm so glad I'm showing up again. P.S. No doodlebugs were squashed during my run (to the best of my knowledge and efforts). P.P.S. 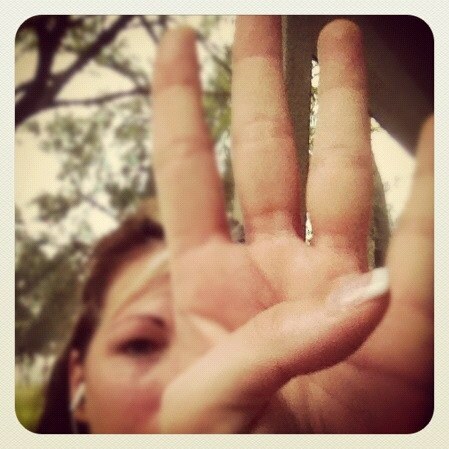 Listening to Pumped Up Kicks, by Foster the People really helped me knock out the last bit of mile between 3 & 4. I'm fairly sure the song is about shoplifting (or worse?) but it sure is kicky. I agree though, super fun song to run to! Okay, I couldn't help myself so I googled the song. But I'm blocking the true meaning out of my head and sticking with shoplifting. Haven't been by in way too long..so sorry about your foot and missing New Orleans!